Stretched over 250 acres of landscapes, the award-winning and awe-inspiring Gardens by the Bay is the most anticipated tourist attraction in Singapore. Next, to Marina Reservoir are the gardens which house a lot of amazing features to amaze the visitors of all age groups and these are well worth a visit. What are Gardens by the Bay? Gardens by the Bay is a vivid and huge future-ready park by the bay of Singapore. It is well known for its incredible and giant Supertree structures and breathtaking skywalk off the gardens, hundreds of plants and trees to explore, and the magnificent seashell-like greenhouses that recreate the scene of chilly climates. 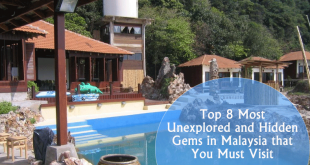 All these things make this destination fun and exciting for both adults and kids. 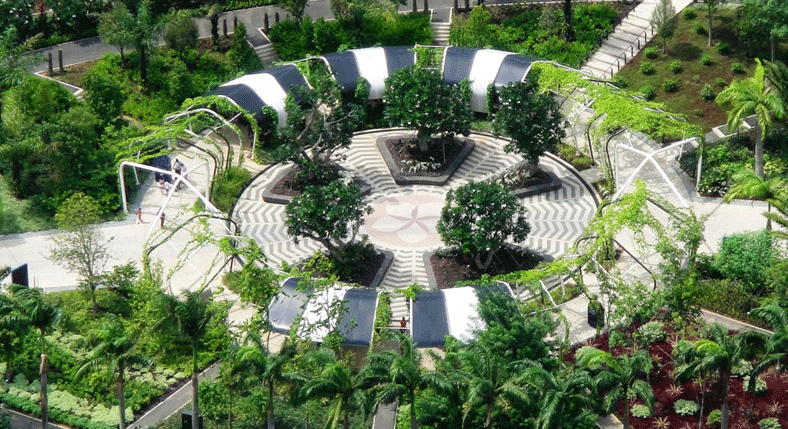 Reach the top of Marina Bay Sands to grasp the full view of Gardens by the Bay, which is located just off the park. It is stretched over 250 acres on the waterfront. It is very easy to reach here, i.e. through walkways from a hotel, while enjoying the breathtaking views of lush greens. You can also take promenade which is a bit longer to reach the park around two domes. You can walk along the park for free. But walking around the Supertrees or entering the temperature-controlled conservatories is chargeable. The opening time of the main area is from 9 AM to 9 PM. 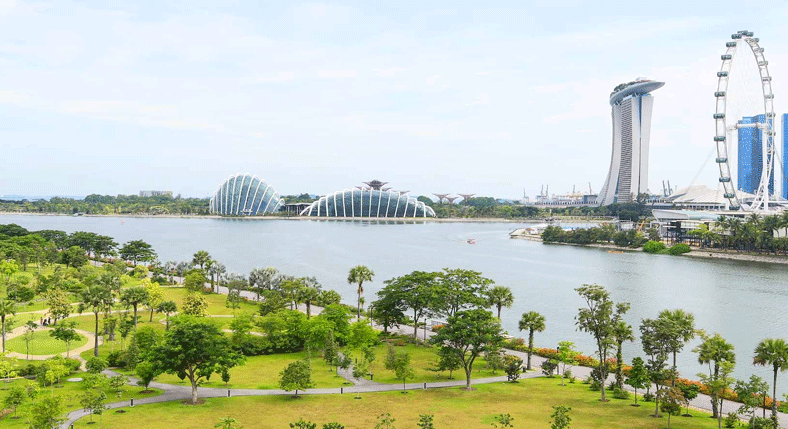 Gardens by the Bay consist of two different gardens on the waterfront – Bay East and Bay South. 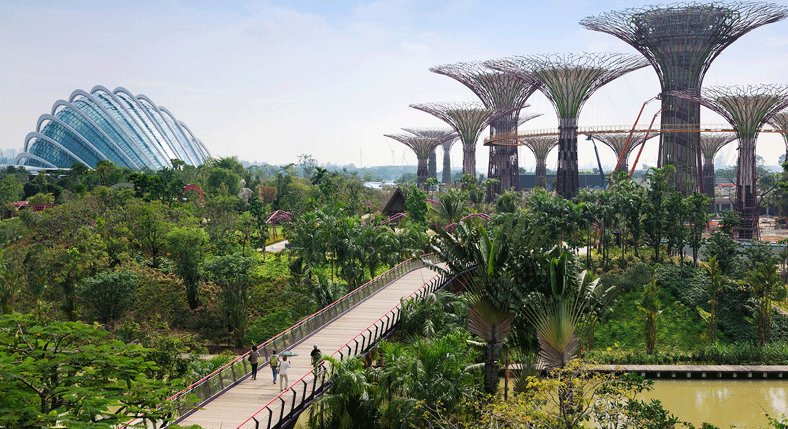 The largest garden is Bay South where you can spot the iconic Supertrees and cooled and award-winning conservatories. Bay East Garden is less about the well-landscaped greens and wow-factor and more about a wide open waterfront space to greet the visitors and locals to have fun at their leisure. You can enjoy the breathtaking views of the stunning skyline of Singapore and serene and tranquil picnic spot in Bay East to enjoy a quiet stroll and relax. 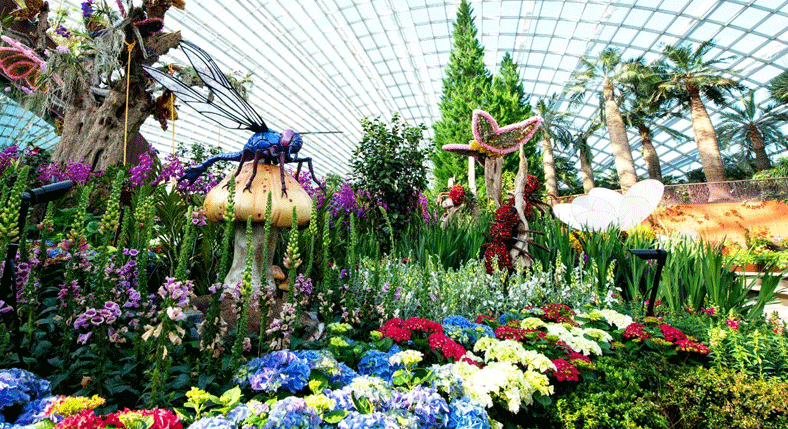 Gardens by the Bay has Kingfisher Lakes and Dragonfly, both belonging to its lake system. It also has the Marina Reservoir extension to visit. 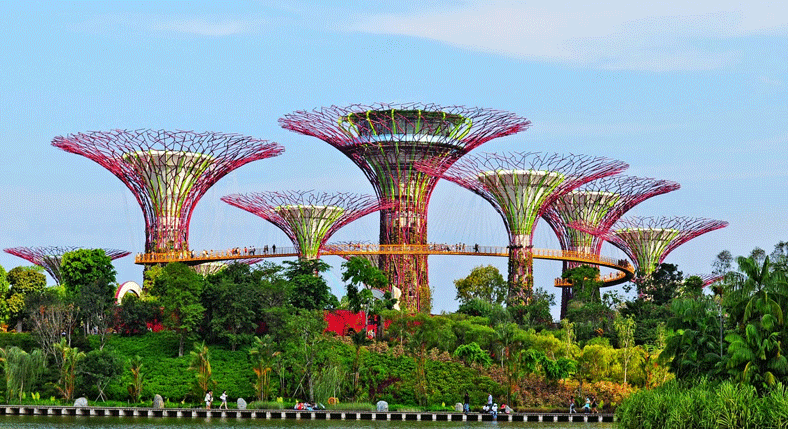 Supertrees are one of the main attractions that attract visitors to Gardens by the Bay. They make it look like something brought from a sci-fi movie. The vertical tree-like gardens stand around 25 to 50 meter tall, averaging up to the height of 16 storied complexes. In total, it has around 18 Supertrees made up of over 162,900 plants and over 200 species and types of orchids, ferns, bromeliads, and tropical flowers. It is nonetheless amazing. From the ground, you can gaze at the Supertrees for free. Or you can walk OCBC Skyway for S$8 which is placed 22 meters off the ground on the aerial walkway which is 128m long. You can take your tour around 25 meters up to the stunning walkway to capture a stunning view. At the center, there is a 50m long tree for an ultimate dining experience with a 360-degree view to the Supertree from the lounge as well as a roofless treetop bar. It is another impressive conservatory in the Gardens. The Cloud Forest is literally a world in itself. There is a 35m tall mountain that is sprawled in tropical greens and the tallest indoor waterfall in the world. You will feel like you have slipped to a tropical landscape. You can get the aerial view of everything from Treetop Walk and misty Cloud Walk. If you have kids, you can visit the Children’s Garden and chill out at the Water Park and outdoor playground with features like spray jets and water tunnels to keep you cool and beat the notorious heat of Singapore. This traditional conservatory takes you through various notches. One of the best examples here is the Flower Dome. It is the world’s largest greenhouse made of glass. It was also listed in Guinness World Records in 2015. The largest dome consists of flowers and plants from different parts of the world, such as olive groves, Mediterranean garden, South American garden, and South African garden. It is the huge fusion of four themed landscapes where you can find the links between the rich history of Singapore and plant life. 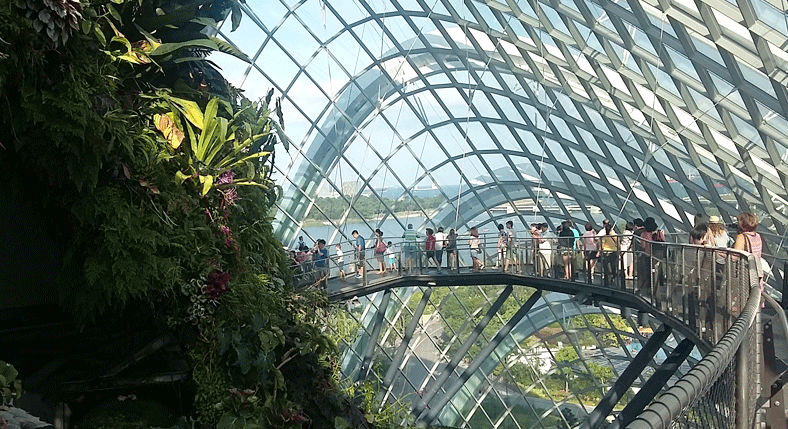 Gardens by the Bay is not all about lush greens. 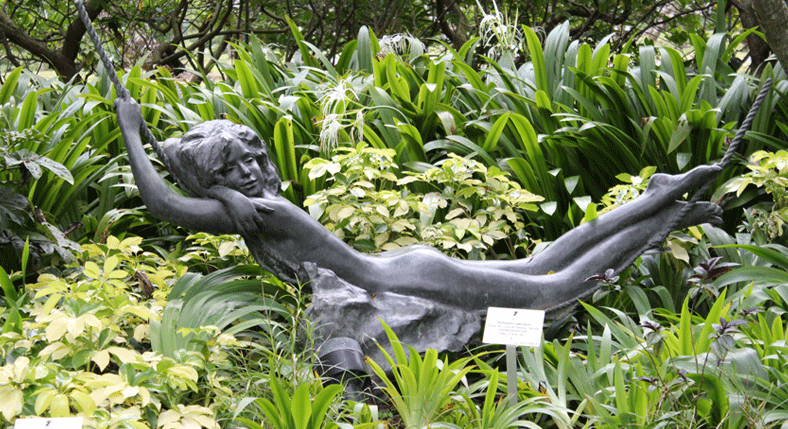 It houses over 40 sculptures from different parts of the world spread along the grounds. Gardens also have amazing shopping and dining scene. It has a huge range of cafes and restaurants for all the visitors who crave something delicious while exploring the huge range of flora. You can also shop some souvenirs from the gift shops on site. At 18 Marina Gardens Drive, Gardens by the Bay is accessible in different ways, whether you take public transport or walk. Walk from Helix Bridge to Art Science Museum – There are trails lead you to the Art Science Museum under the East Coast Parkway (ECP where you will enter directly into Bay South Garden which is located on the waterfront. 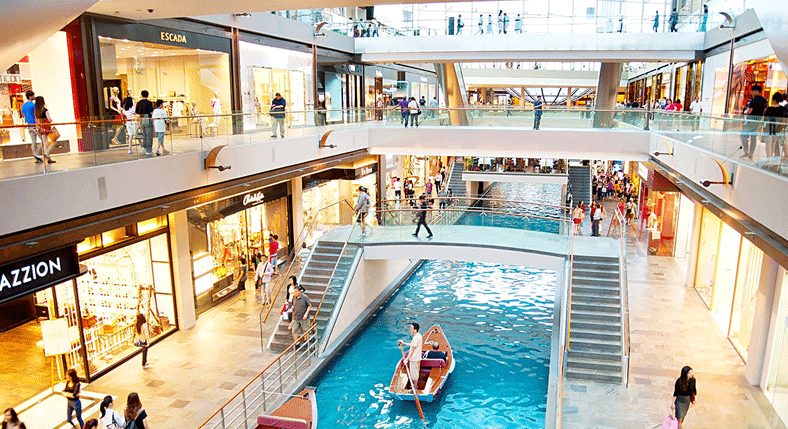 Walk through Marina Bay Sands – You may walk around the Lions Bridge overhead at Marina Bay Sands Hotel (opens from 8 AM to 11 PM every day) or underground link via Exit B of Bayfront MRT Station. 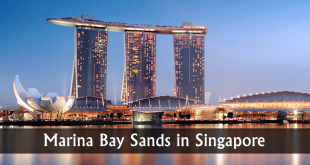 Public transport – You may head to Downtown Line or Circle Line to reach the Bayfront MRT Station. Go through the underground linkway from Exit B. Now you and cross the Meadow Bridge or Dragonfly Bridge to reach the Gardens by the Bay. The night is one of the best times when trees at the Supertree Grove lit up dramatically. Be sure to take a lot of time so you can fully explore the sprawling gardens. There are also many amazing things you shouldn’t miss. 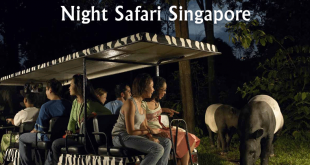 If you are running low on time, OCBC Skyway and Supertree Grove are the best options to get the most of your tour. You can head to the far side of Gardens by the Bay if you like to chew something while eating while walking at the Marina Bay Sands hotel. Satay by the Bay is one of the amazing hawker hubs on the back of the park, which offers various international dishes.